The Jordan Retro 6 may be over for adult sizes but for Kids and women there is still one more retro to drop. This new retro 6 is similar to one that dropped back in 2010 that feature a all white upper with a rainbow midsole, but it looks like the white was switched with black and patent leather added to the mid panel. These are set to drop Sep.1 alongside the "Dark Charcoal" 7's. Let us know what you think of this new GS Retro 6. Tired of the teaser? Ok no more! here's a look at the Grape Retro 13 in its full glory, also we see a grey and Pink Retro 13 that will also be released in GS sizes and last but not least the Strawberry FLOTG 5 that we showed you a teaser image of yesterday. Women and kids will be set for next year with many hot colors that are already leaving the men jealous. Start your petitions guys if you would love to see those Grape 13's released in Men's sizes! Check out the image and stay tuned for more early Pics from TCC. Let us know what you think of these. Last few days TCC has been giving you looks at upcoming GS Retro's for 2013 from the grape 13's now to this upcoming Retro 5. Next year marks the 23rd anniversary for the Jordan 5 so expect to see many classic and new colorways for Men's and GS sizes. This retro 5 will feature a Strawberry color with the now classic FLOTG logo on the heel. Check this teaser image out let us know what you think. Yesterday TCC gave you a look at a upcoming Retro 13 Grape colorway releasing next year. Along with that New GS color Little feet collectors will also get more new colors. Here we give you a teaser look at the upcoming Squadron Blue Retro 13 colorway, the colorways is a toss up, not something we have seen from JB before but who knows it might be a huge hit. Take a look at this pic and let us know how you feel about the colors? More pics coming soon. 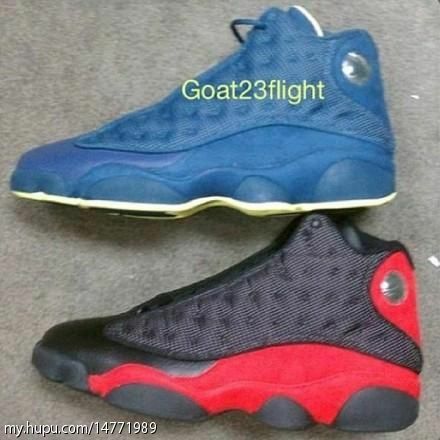 Next year is a big year for fans of the Retro 13 with many new and old classic colors slated to come out. But for the little feet Jordan fans you may be getting a colorway that may have size 8 and up Jordan fans very jealous. Next year Jordan Brand will be throwing the classic Aqua/Grape colorway onto the Retro 13, but good news comes with bad news looks like this release will only be GS sizes only. Stay tuned for more info and pics and hopefully Jordan brand Decides to make these in adult sizes as well. One of the most popular hybrids in Jordan history will be coming out yet again this holiday season. There seems to be no stopping this Jordan style. This new color brings together a classic colorway to a new style. Many blogs originally named this shoe "Toro" after the Toro Bravo Jordan 5 that Dropped in 2009. But in fact the red is very different from the Retro 5 and also the materials used, The new red on the shoe is called "Gym Red". Look for these to Release this holiday season for retail $175. Will you be copping these? Let us know. The classic Jordan 13 will be returning in 2013 in a few New and old colors. 2 colors pictured here that will be released in the early part of the year will be the classic Jordan 13 Bred colorway. Holding on to its classic black red look the bred 13 will probably not feature the 3m affect seeing how the 2010 Retro Models did not either. The other shoe is a new colorway that TCC First broke news of a month ago. we gave you a few photoshop renderings that gave you some idea of what the shoe looks like but now we see actually images. Similar to the Altitude 13 in some way this model features a all Blue upper and a Dull yellow sole. What do you think of the 2 pairs? Will you be copping? One of the hottest release of the Holiday season will be the return of the Jordan 4 Retro Breds. This classic shoe became a iconic symbol in the career of Jordan. There is not doubt that this release will see a instant sellout and maybe cause more raffles in the Nike industry. Here are a few more deatiled pictures of the Upcoming release. The shoes are a step up form the 08 CDP Pack version featuring a softer nubuck upper and a over all sleeker look. Let us know if this is one pick up you will be copping this holiday season.